“The Interdependency,” a galactic empire spanning dozens of far-flung human settlements, has stood for a thousand years. The descendants of Earth long ago discovered how to access “the flow,” a current that runs parallel to real space and allows ships to travel vast distances in very short times. The flow only intersects with real space in certain areas, so human habitation and the empire cluster around these access points. Without the flow, interstellar travel is impossible. Without the flow, most humans would die, since the access points are usually near stars which have no naturally habitable planets, so the various planets of the empire are truly interdependent. Without the flow, the empire collapses. And the flow is collapsing. The Collapsing Empire is the first book of a planned new series by John Scalzi, and it has exploded onto the science fiction scene. Winner of the 2018 Locus Award for Best Science Fiction Novel, it is also a 2018 Hugo Award finalist for the same award. 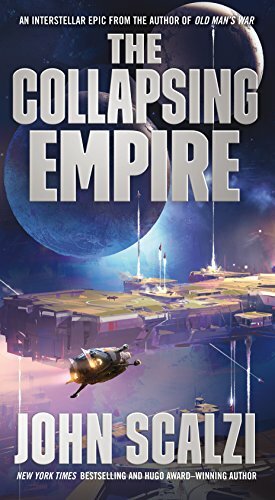 Scalzi brings his trademark humor and irreverence to this novel of an empire potentially facing destruction. He cares about the science, avoiding things like faster-than-light travel that violates known physical laws. But his gift is in imagining complex worlds and populating them with complex people. His characters include an “emperox” who never planned to become a ruler, a scientist who did not want to leave his home planet, a very horny and foul-mouthed mercantilist who does some of her best thinking while amorously engaged, and a family of ruthless and ambitious nobles who do not mind shedding blood to reach their goals. The worlds of The Interdependency are quite different from the norm in science fiction. Scalzi imagines an empire connected only by access to transportation. Earth became inaccessible long ago. When humans discovered the flow, they learned they could travel unimaginable distances but only reenter real space at specific points. This meant that settlements were limited to the stars that were accessible via the flow, whether or not they had inhabitable planets. The capital planet of the Empire is Hub, a planet tide-locked to its sun. One side always faces the star, one side always faces away. Humans have created a vast underground settlement where millions of people live. Many essentials must be imported from other places in the empire. Some stars have no inhabitable planets, but huge space stations housing vast populations have been built there to support mining and other extraction of resources. Only one planet in the entire empire, “End,” is capable of sustaining human life on the planet itself. Hub became the lead planet of the empire because all currents of the flow led to it. (This reminded me of the saying, “All roads lead to Rome,” which Isaac Asimov adapted in his Foundation series to “all roads lead to Trantor.”) All planets in the Empire directly connect to Hub, while few of them have direct connections to any other planet. If the flow is disrupted, though, Hub and most other human settlements will become isolated and alone, and within a very few years will be incapable of supporting life. The Collapsing Empire shows both the power and the danger of interdependency. It was written before the 2016 US election (but after the Brexit vote), so it is not a direct commentary on contemporary politics. It is, though, a compelling statement. A surface reading would say, “independence is good, interdependency is bad” because the flow is failing. Without the flow, interdependence is impossible and the settlements that rely so heavily on each other would fail. But the better understanding is to see that humanity was only successful because of interdependence. They may be facing a crisis because of environmental change (and I assume future novels in the series will further explore that crisis and human responses to it), but the only reason they have come this far is because of their interdependence. Because of interdependence, humans were able to spread across the galaxy. They were able to build settlements on moons, on space stations, on ridiculously inhospitable planets, and they were able to maintain a coherent, unified government for a thousand years. Yes, it’s a work of speculative fiction. It is also, though, a powerful statement of hope in the collective power of humanity when they pull together and rely upon each other. Scalzi is not one to ignore the venal and self-serving ambitions of individuals. His characters are petty and lusty and greedy and ruthless. But some of them are also caring and passionate and thoughtful and deeply committed to the survival of humanity. I am eager to see what happens next, when The Consuming Fire is released in October, 2018.